HIV/AIDS Denialism – seems to feed into some egomania of this particular type of denialist. They frequently make statements about how one day they’ll be vindicated, and seen as heroes because they saw the truth first. They also seem to really like inversions, and to feel superior because they believe in something that no one else does. Other conspiracy theorists, such as 9/11 conspiracy theorists, I think are similar. There is an egotistical appeal to possessing “secret” knowledge or holding controversial opinions. Basically, I’m calling them assholes. Global Warming denialism – motivations seem to range from financial (industry, their lobbyists and think tanks), to individual cognitive dissonance. Many global warming denialists that argue from a non-financial standpoint seem to fear the changes that reducing a carbon footprint entails, and are concerned about losing quality of life. Others, I think, suffer from the same egomania as the HIV/AIDS denialists like Monckton. Still others, most recently Falwell, seem upset from a religious perspective as it suggests humans could somehow harm God’s creation or worse, that global warming might be a positive sign of Armageddon. Creationism/Intelligent Design Denialism – Almost exclusively religious objections, stemming from cognitive dissonance from fear of non-literal interpretation of the bible. The insistence on believing the truthfulness of some of the more absurd stories of the Bible such as Noah’s Ark seems indicative of a certain stubbornness and fear of upsetting the fragile balance of the literalist’s world view. The idea that the Bible might contain metaphor, rather than absolutes, is therefore terrifying and ideas such as evolution, that appear to negate the creation myth must be opposed at all costs. Holocaust Denial – Hopefully we won’t have to cover this disgusting kind of denialism as much. Its motivations are perhaps the clearest of them all. It’s just plain Antisemitism. Anti-Vaccination denialists – I have less experience with these but it seems mostly to be fearfulness of science, and a propensity towards believing in what Orac would call “woo”. A small amount also seems to be paranoia or paranoid personality disorder. Finally, I think many of the parents of autistic children seem fearful of genetic or environmental causes of autism that might implicate their culpability in their child’s illness. Sadly, throughout the history of autism parents have often been blamed, specifically absent fathers and cold or “Frigidaire” mothers were implicated. So it’s understandable if people still feel some stigma or guilt from such a diagnosis given such a cruddy history from the psychologists on that one. Many parents would like to believe in something, anything that explains why their child has been singled out by nature to have autism. Having something to blame, like a vaccination, therefore becomes emotionally very appealing and alleviates some of the helplessness or misplaced guilt they may feel. Animal testing denialists – I am somewhat uncertain about inclusion of some animal rights activists (ARAs) into the denialism camp. My reasons for doing so include the general dismissiveness I’ve seen of science by ARAs. For instance, saying things like science can be done without animals (or worse on a computer), claims from PETA that chickens are as smart as dogs or babies, that dogs are actually vegetarians (oy), and any number of discussions in which they imply that animals or animal models say nothing helpful about biology. Their motivations, for the most part, are more noble, they’re interested in alleviating suffering, all suffering. That this is impossible, misguided or unwise is not important, and if they have to lie about science then so be it. 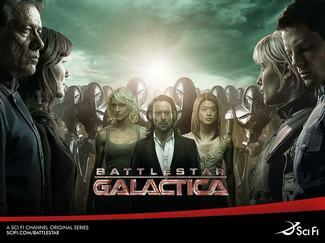 While fans are preparing for the season finale by playing “guess who is the Cylon,” the SciFi Channel has announced that season four will have twenty-two episodes of Battlestar Galactica as is customary on the broadcast networks, as opposed to the thirteen episodes originally planned. This will include a two hour episode in the fourth quarter which will also be released on DVD. After season three being a bit of a let down compared to the first two, I do hope that they can sustain the quality over the full season. Perhaps the longer time frame will allow them to more gradually set up situations for the next season. As for guessing the Cylon, we are certainly being led to believe it may be those who are hearing that music–Colonel Tigh, Tori, and Anders. It would be especially easy to either write out or radically change the role of either Tori or Anders, especially with Starbuck apparently dead. Having Tigh be a Cylon without realizing it would be a strange twist considering his policy on suspected Cylon collaborators, but hasn’t he been through enough all ready? We know little about Tori so it would be easy to change her role dramatically. If Kara Thrace is dead or radically changed, this would also be an easy way to give Anders a new role. Besides, if Starbuck does return (as I suspect she will to set up the end of season cliff hanger), she’s now free to go after Lee if they get Anders out of the way. Besides guessing that we will see the return of Starbuck in the season finale, I’m betting that Baltar either gets acquitted or otherwise escapes execution. He’s just too complex a character to be eliminated. Perhaps Gerald Ford will offer him a full, free, and absolute pardon for all crimes committed as President. We can bet President Roslin won’t make such an offer. As has been feared since tha announcement of the press conference yesterday, Politico has reported that John Edwards is suspending his campaign due to the recurrence of Elizabeth’s breast cancer. It is not known whether he will be dropping out. It is understandable that at this time Edwards must make his family his top priority and hopefully the recurrence can be treated successfully. I still recall when word first came out about Elizabeth’s cancer and we received a number of hostile comments about her on the pro-Kerry blogs which remained open after the election. This sick attitude persists as some of the initial comments at Politico’s post also have derogatory comments about them. The official press conference to make the announcement is scheduled for noon. Update: At the press conference Edwards announced he will remain in the race. Update II: The loser of the day was Ben Smith at Politico who released a story before the press conference stating that John Edwards would be suspending his campaign. CNN and other media sources quoted him multiple times in the coverage leading up to the press conference. Ben Smith has a follow up post about the error in his earlier post here. Update III: The Populist writes that bloggers “look very stupid” for misreporting the story that Edwards was going to suspend his campaign. Bloggers who quoted Politico hardly appear stupid. Politico has broken other stories and is considered a reliable source. CNN and other members of the newsmedia were also quoting them. Web sites such as at CNN had banners with the “breaking news” that Edwards was suspending his campaign, giving the impression that this story had been verified. Bloggers, who do not have the access to receive independent verification from the campaign, were doing all we could reasonably do in linking back to our source, and checking other news sources to see that they were also carrying the story. This blog entry was also updated and corrected while the press conference was in process. On the other hand, news organizations which carried this story, and which do have the abiility to obtain independent confirmation, could be open to criticism. Eubanks, who served for 22 years as a lawyer at Justice, said three political appointees were responsible for the last-minute shifts in the government’s tobacco case in June 2005: then-Associate Attorney General Robert D. McCallum, then-Assistant Attorney General Peter Keisler and Keisler’s deputy at the time, Dan Meron. The politicization of the Justice Department is coming under increasing attack, even from Republicans. Think Progress has video and a transcript from an interview in which Bob Barr charges that, “the integrity of the Department of Justice is being used as a political football.” Watching the White House fight subpoenas for officials including Karl Rove to testify is reminiscent of the Watergate era. They even top Rose Mary Wood and the 18½-minute gap with an 18-day gap in the emails released. As the Washington Post notes in their headline, Gore Returns to Capitol Hill a Hero and a Target. While many news reports described the “rock star” treatment he received as record numbers of people tried to hear Gore’s testimony, the right wing, as usual, has resorted to dishonest smears due to a lack of any real rebuttal. The most absurd and dishonest attack came from Senator Inhofe, who found it newsworthy to release a press release that Gore wouldn’t sign a pledge he came up with which has little to do with what Gore actually advocates. This is reminiscent of the recent smears on Gore’s energy use, previously discussed here and here. Inhofe takes the contradictory stance of denying the established science on climate change while simultaneously calling on Gore to personally take a pledge to take action which differs substantially from the action which Gore recommends. Inhofe also stresses the energy use at Al Gore’s home, ignoring the difference between Gore’s recommendations on carbon use as opposed to total energy use. The call for Gore to limit the energy use in his home to that of the average American family is also absurd considering that both he and his wife run businesses from the home, and that the home is in an area with substantially above average energy needs for cooling. Besides, considering how he is owned by the energy industry and repeats their line regardless of the degree to which it is contradicted by the consensus of scientific thought, Inhofe is the last person to raise charges of hypocrisy against anyone. Needless to say, the conservative blogosphere (such as here, here, here, and here), always ready to join in an attack on a Democrat without any regard to its validity, is regurgitating this attack just as they’ve been programmed to do. Once again we see how conservatives react when all the facts are against them. “We look upon authority too often and focus over and over again, for 30 or 40 or 50 years, as if there is something wrong with authority. We see only the oppressive side of authority. Maybe it comes out of our history and our background. What we don’t see is that freedom is not a concept in which people can do anything they want, be anything they can be. Freedom is about authority. Freedom is about the willingness of every single human being to cede to lawful authority a great deal of discretion about what you do,” – Rudy Giuliani, March 1994. This is being interpreted in different ways by different bloggers. Even if we concede, as Matthew Yglesias does, advantages of ceding some discretion to authority, this is hardly a satisfactory view of what freedom means, especially in light of Giuliani’s poor reputation with regards to civil liberties. Those who have been following some of the discussions on Rudy Giuliani here, such as in the comments to this post, may view Giuliani and his alleged libertarian support in a new light. As is noted from the comments of Eric Dondero, who bills himself as Acting Chairman of Libertarians for Giuliani (as well as leading a number of other “libertarian” organizations which I suspect represent groups of one), this is a strange variant of libertariansm. Giuliani’s top “libertarian” supporter dreams of what would amount to a military dictatorship in which only “Military Guys and Military Veterans” have rights and no dissent from “leftists,” “wusses,” or “girlie-men” (i.e. anyone who disagrees with him) will be allowed.